Blairstown—Darlene J. Tiedemann, 90, passed away Wednesday, March 20, 2019 from congestive heart failure. Funeral services will be 10 a.m. Saturday, March 23, 2019, at Grace Lutheran Church in Blairstown with Rev. Jeffrey Schanbacher officiating. Visitation will be 4 to 7 p.m. at the church on Friday, March 22 and for an hour before services on Saturday. Burial will be in Pleasant Hill Cemetery. Darlene Jeane Sikir was born October 17, 1928 on the family farm near Chelsea, IA, to John and Josephine Kubisek Sikir. 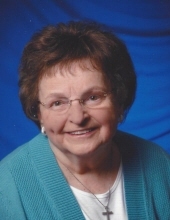 She attended Salt Creek #2 country school through the 8th grade and graduated from Belle Plaine High School as class president and valedictorian in 1946. She then worked as secretary to the school superintendant until February 3, 1949 when she married Renn Tiedemann at the First Lutheran Church in Belle Plaine. The couple farmed north of Blairstown and moved to town in 1985. Darlene was a long time member of Grace Lutheran Church. She enjoyed playing bridge, crosswords and served on the Blairstown Library Board. She and Renn enjoyed traveling. They visited all fifty states and made several trips to Europe. formerly of Victor; several great grandchildren and several nieces and a nephew. Darlene was preceded in death by her parents; her husband in 2002; sister, Gladys Hecht; siblings Evelyn, and Leonard, both in infancy and granddaughter, Anna Morgan. To send flowers or a remembrance gift to the family of Darlene J. Tiedemann, please visit our Tribute Store. with Rev. Jeffrey Schanbacher officiating. 21st Ave. and 78th St.
"Email Address" would like to share the life celebration of Darlene J. Tiedemann. Click on the "link" to go to share a favorite memory or leave a condolence message for the family.